Mexico City's mayor has accused police of making serious errors during a raid at a packed nightclub which led to the deaths of 12 people in a stampede. Marcelo Ebrard also suspended all public employees directly involved in the raid on the News Divine club. The club's owner was detained earlier. Police said he had caused panic by announcing the raid to the crowd. 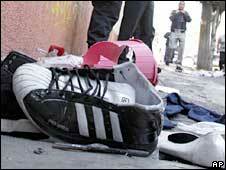 Nine youths and three policemen died in the raid to check reports that drugs and alcohol were being sold to minors. Three of the stampede victims were aged 13, 14 and 16, city prosecutors were quoted as saying by the Associated Press news agency. At least 13 people were injured during the raid, police said. Some 500 youths celebrating the end of the school year were in the club at the time, officials believe. Mr Ebrard said he had ordered an immediate investigation into the tragedy, and said that after reviewing information on the incident that "serious mistakes" had been made. 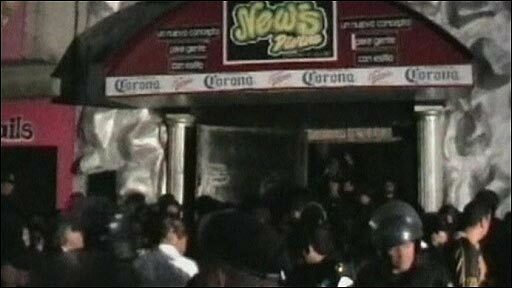 Earlier, Mexico City police chief Joel Ortega told Mexico's Televisa that the panic began when the club's owner announced that police officers were about to arrest everyone in the News Divine club. Mr Ortega said the venue had a single entrance and an emergency exit, which he said was blocked by cases of beer. "Many of the people concentrated at the club's emergency exit, but it was too small and it was there that people died of asphyxia," he said. But a club employee told the Associated Press that police had blocked the exit. There was chaos as the party goers struggled to reach the streets, the BBC's Duncan Kennedy in Mexico City reports. When emergency teams arrived they could be seen carrying out stretcher after stretcher some with people who had survived, some with people who had not, our correspondent says. Distraught mothers later came looking for their children, while others stood looking dazed at what had happened. The club had been closed last year for safety violations, but the owner successfully applied to have it reopened. Selling alcohol to people under 18 is illegal in Mexico and nightclubs are allowed to operate only within certain time limits. But those laws are often ignored by bars and the clubs, our correspondent says.